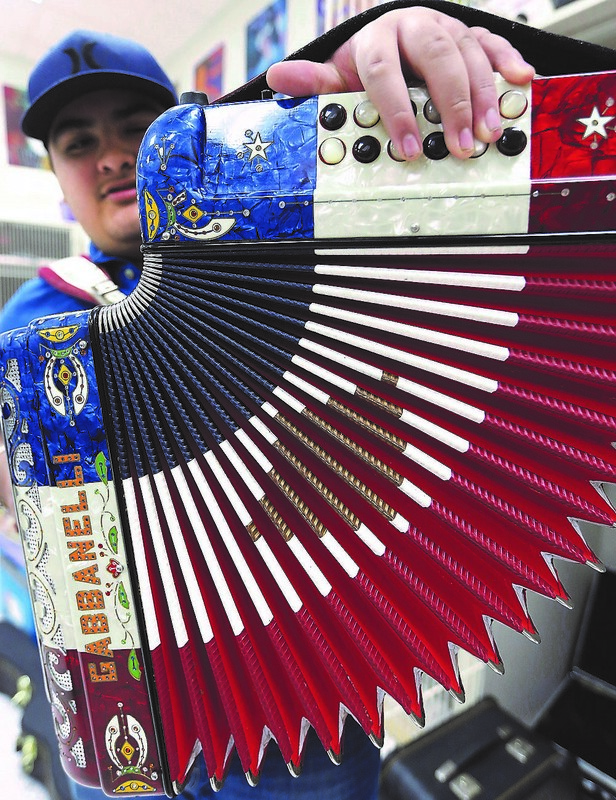 PALMVIEW — Johnny Joe Gutierrez, a sophomore at Palmview High School, said that when he was younger, his father would play the accordion with friends at gatherings and all he wanted to do was join them. He remembers having to convince his father at 10-years-old that he was serious about wanting to learn how to play, and soon, Gutierrez was given his first instrument — a small black beginner’s accordion. He said his father is his role model, and that playing the accordion is one way he tries to be like him. “Everything he did, I wanted to do.” Gutierrez, a Palmview native, said. Now 16, Gutierrez dedicates every performance to his father, since he was the first person to believe in him. Gutierrez said that he always looks for his father in the crowd from the stage, and on Saturday at the Big Squeeze showcase, it was easy to spot his most loyal supporter. Gutierrez was one of the 10 competitors at the 13th annual accordion competition which was held at Palmview High School. Nine showcases were held around the state, ending with this event here. 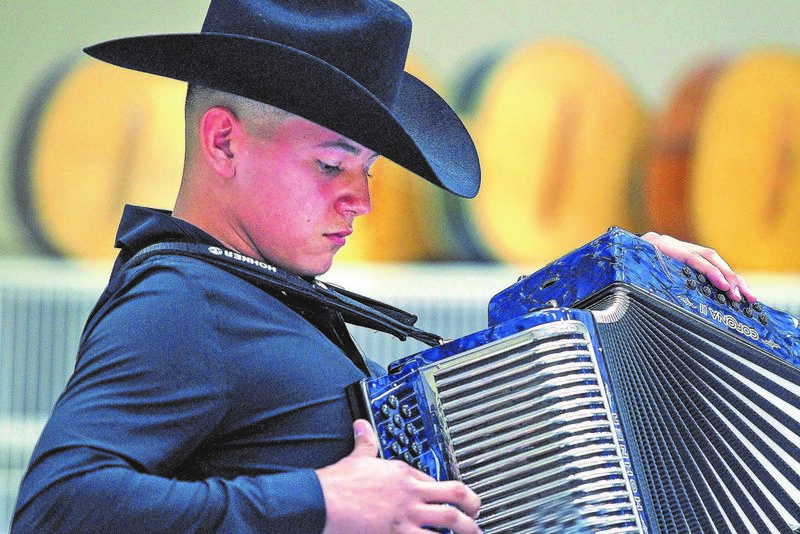 Videos of students’ performances are sent to accordion specialist and judges around the state, who will then choose 12 semifinalists who will compete at the Museum of South Texas in Edinburg on April 27. From there, six finalists will be chosen to perform at the Big Squeeze Finals at the Bullock Texas State History Museum in Austin on May 11. Last year, Gutierrez advanced to the Austin performance and placed second. His competing song was “Viva Seguin” by Santiago Jimenez. The Big Squeeze is hosted by Texas Folklife, a nonprofit organization based in Austin that focuses on preserving Texas culture, and supporting accordion musicians is an integral part to that mission. 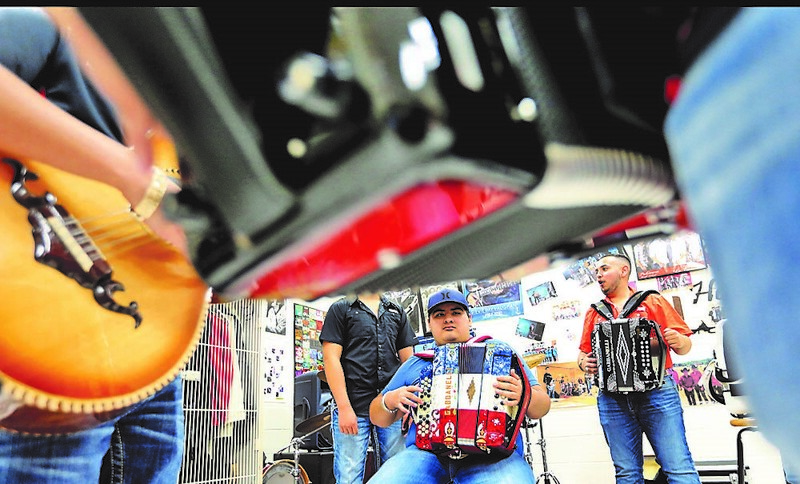 At the Palmview competition, participants expressed their passion for playing the accordion through conjunto – a genre of tejano music created by collaboration of German accordionists and Mexican musicians in the Rio Grande Valley. Conjunto music lifted the spirits of the Mexican working-class in Texas during the 19th century, and since then, the delight found in accordion music continues to live. As student-musicians took the stage in the mariachi hall of the school, children in the audience copied the hand-movements of performers, playing accordions that they imagined to be strapped to their chest. And while performers seemed nervous before starting their song as they had to state their name and song choices, once they began playing they seemed to find comfort in the music, grinning as they played. 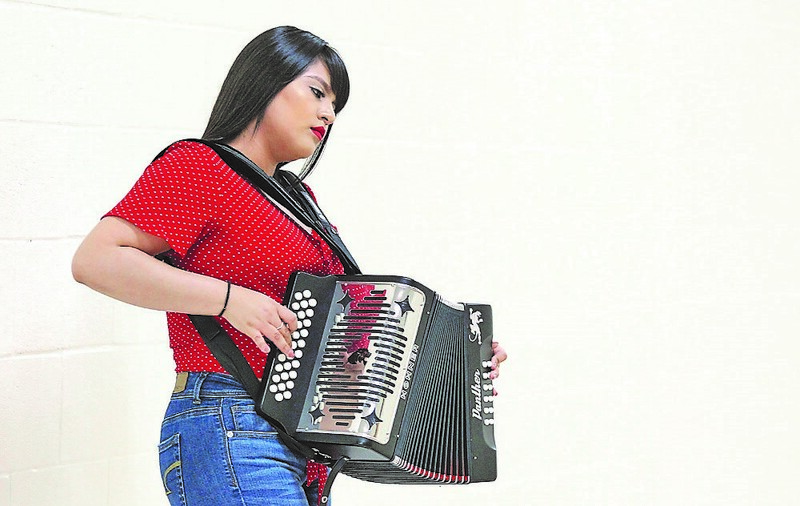 Maria Alejo, a senior at Jimmy Carter Early College High School, has been playing for two years now and said that her dedication to the accordion is what drives her to play. She was gifted her first accordion by her mother when she was a sophomore, and learned how to play by watching tutorials on YouTube. On Saturday, Alejo was the only female competitor. “Anyone of any gender can play, I just think we should encourage more girls to play the accordion,” she said. Eduardo Garza, 18, carries a similar mindset which has led his close friend, Martin Flores, to finding his favorite hobby. The two became friends as 6th grade students at Irene M. Garcia Middle School in Mission, and as sophomores at Palmview High School, Garza motivated Flores to consider learning to play the accordion. After teaching Flores the basics and techniques to the instrument, Flores now takes pride in playing and says that Conjunto keeps him close to his family and culture. As seniors now, they both competed at the Big Squeeze this Saturday. He added that his family adores Tejano music, and knows that his grandparents would have loved that he is now an accordionist. Garza said that his reason for playing is to bring honor to the old genre. Conjunto accordionists are unique in that they do not require sheet music when rehearsing, composing or performing; choosing instead to improvise and play by ear not unlike traditional jazz musicians. On the Palmview stage stood a speaker and two microphones — one for the accordion and the other for the performer. Accompanying each performer was someone playing the bajo sexto, a Mexican string instrument that is similar to the guitar. After accordion performers introduced themselves, the hall fell silent. Before playing, the student-musician would start the song by tapping the beat on the wooden stage with the heel of their boot to get in synch with the bajo sexto player. While playing, accordionists swayed to the melody of the song, and at intense parts, made eye-contact with the bajo sexto player. Texas Folklife Executive Director Charlie Lockwood said that fostering a space where students can perform and find their place in music is why he continues to support the youth accordion competition.